The final segment of a road trip across the entirety of Russia concludes with stops along Europe’s longest river and visits to some of the country’s most historic cities. The highways get busier here, but the sights along the way are well worth the occasional traffic jam. Kilometers continued to tick off on the car’s odometer. On the entire drive across Russia, a new river seemed to pass by outside the window every time I looked. From my starting point in Vladivostok on the Sea of Japan, I had passed the Yenisei, Ob, and Lena rivers—some of the world’s largest waterways. Raindrops splashed down on my windshield as I pulled into the city of Samara and caught a glimpse of a river as wide as the Nile. I was looking at the Volga, the longest river in Europe. A famous Russian proverb states that to know Russia is to know the Volga. During my short stay in Samara, that is exactly what I tried to do. The rain cleared the following morning and I spent the entire day at the beach. Locals gathered in droves to sunbathe and swim in the wide stretches of the Volga. My back ached from the hours spent behind the wheel. I bought a beer to ease the pain at a nearby kiosk, lay down in the hot sand and blissfully gave myself over to the sun’s powerful rays. The riverfront in Samara is huge and you can wander near the banks for hours. Around sunset, I took a relaxed walk along the mighty river, which extends for a kilometer or so to the other side. In the coming days, I began to consider the Volga as a sort of natural border—between the hinterland where I had come from and Russia’s largest cities. West of Samara, traffic picked up and truckers began to dominate the highway. This was an adjustment for me after the peaceful roads of Siberia. I gripped the steering wheel with white knuckles. After braving the crazed traffic whirling around the periphery of Moscow, I took a few days off in the capital. I felt torn between the need to rest my weary body and the urge to explore this fascinating metropolis. 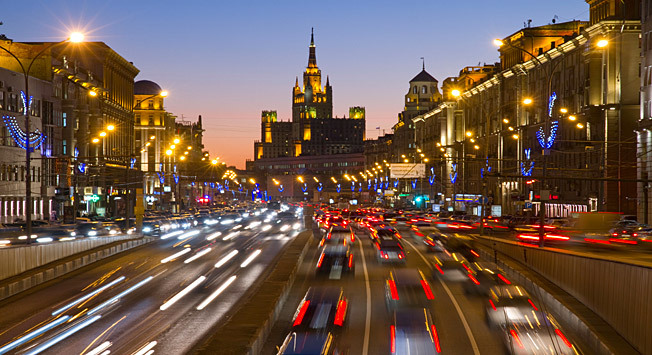 Approaching its 870th birthday, Moscow is an old city filled with motion and vibrancy, unlike the empty country that I had spent the last few weeks driving through. As I traipsed through Moscow’s ancient streets, I was overwhelmed by the sheer amount of history, legend and fate that had played out in Russia’s capital. Unlike most major cities, navigating Moscow was a treat. The metro stations appear like subterranean palaces lit by sumptuous chandeliers. Stained glass windows, bronze statues and rich mosaics decorate the walls. I got off the train in Red Square and the Kremlin’s walls rose before me in a lavish display of palatial architecture. It was like a scene from a children’s fantasy story about knights and dragons. This was the symbolic center of the vast country I had driven through. The Trans-Siberian Highway ends, as any great road across Russia should, in the far north. I turned onto the M-10, the last segment of the Trans-Siberian Highway, coming out of Moscow. Rows of concrete apartments faded behind me at the edge of the city and were soon replaced by wooden cabins and small villages that reminded me of the hamlets I had left behind in Siberia. Small Russian villages were not the only thing that I would see again on the final leg of my journey. Just a few hours out of Moscow, I stopped in the city of Tver and came to the Volga again. Although I had driven over 1,000 kilometers since leaving Samara, Europe’s longest river made another appearance on my trip. I got back in the car. The Volga disappeared and as it did images that I had taken in during the nearly 11,000 kilometers of the Trans-Siberian Highway swirled through my head: cows standing in the road in the Russian Far East; the great Amur River that separates Russia from China reflecting a scarlet sunset at dusk; the endless green of the Siberian taiga; the rocky coast of Lake Baikal and crystal clear lakes in the Ural Mountains. All of that was behind me and I was now met by the end of the road and one of Europe’s most beautiful cities. The Gulf of Finland marks the western terminus of the Trans-Siberian Highway. I stepped out of my car and stared at the boundless sea. I had put as many kilometers on the car during this epic trip as some people might in an entire year! Although exhausted by this expedition, I would gladly do it again. There’s still so much to see.